For years people have talked about the convergence between TV and the Internet. We’ll watch the Internet on our TV’s, we’ll watch TV on the Internet. Well the latter has arguably happened, although rights issues still hamper legitimate efforts to bring TV signals onto the web. The way the TV business has historically worked makes it highly difficult to broadcast TV stations on the Internet. That’s another subject which I won’t get into here, but suffice to say it’s a mess, and is not likely to be resolved soon. What I am interested in and what we spend a lot of time thinking about at WorldTV is how the Internet will come to the TV in our living room. It’s clear that browsing the Internet on your television is not going to take off anytime soon, failed efforts such as WebTV demonstrate little demand for this service. If you’ve actually ever tried to browse the Internet on a TV, even a high-definition one, you quickly find that it’s an unsatisfying and impractical experience. Not having a mouse is a big turnoff, and you need a TV the size of your wall to read a web page from your sofa. I’ve tried… and gone half-blind in the process. 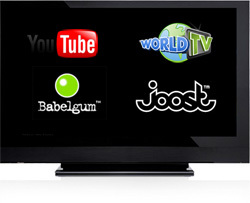 What is interesting and likely to take off soon is watching online video on your TV. This makes sense – the TV is ideally suited to displaying video, it’s something we’re used to doing on a TV, and there’s a whole world of interesting video content on the web that is not accessible on TV. But how can you do this in practice? Everyone thought that the TV/web convergence would happen with us physically connecting our computers to our TV’s. This would open up a whole new world of computing on our television sets and we’d all be happy as Larry. But have you actually ever tried connecting your computer to your TV? Hopefully you haven’t. It’s complicated as heck, and far too complicated for people without propellers sticking out of their heads. I do have a propeller sticking out of my head, and it was a total nightmare for me. You really need two graphics cards in your computer to make it practical (which hardly anyone has), a TV which has a DVI socket on it (which is not very common), and an expensive cable the thickness of oil tanker chains to make it actually convenient. You’re better off buying a separate computer just to connect to the TV if that’s the way you want to go. You’ll still need a TV with a DVI connector (not common). So what next? Well… a small army of accessory manufacturers thought they could solve this problem for us by creating gadgets and gizmos that would interface our TV to our computer. Lots of these products have appeared, usually supplied with complicated software to do things people don’t really want, and the whole thing again is too difficult. The answer to all these problems is really very simple – connect your TV directly to the Internet. Yes, a mindblowingly simple solution that smart 13 year olds have already thought of, and which would finally make the whole thing easier for the rest of us. Build Wi-Fi into the television itself – job done. Internet-enabled TV’s which do this are now starting to appear, although they don’t yet have Wi-Fi, which means using messy network cables, another stumbling block for most people. I saw some Panasonic prototypes at a trade show in January which use Ethernet, and today news of Sony’s Internet TV Link (an Internet add-on for high end Bravia sets) was making the rounds with an announcement about YouTube support being introduced. YouTube is clearly being prolific in bringing their content to TV-connected devices in general, and is the obvious first partner of choice for any consumer electronics company. But these are very early efforts at bringing online video to the living room wall, and they still have a long way to go. For one, the current crop of Internet-enabled TV’s are expensive, and secondly they are likely to become obsolete rather quickly. I’m not aware of any TV yet that has Wi-Fi, and none seemingly yet offer open access to allow access to all online video sites. It is not actually as easy as ‘simply adding Wi-Fi to a television set’ to allow online video browsing. The TV needs a computer built-into it (basically) which adds cost, with Flash support included to allow the TV to view the video streams which online video sites use. If the TV set doesn’t have this, the sites in question have to transcode their streams (convert them) into a format which the TV supports. This is a nightmare for the sites in question, and requires co-operation between these sites and the manufacturers. To make the system truly open and much simpler for all, the TV will need to have a browser built-in like Opera or Firefox, which you can control, so you, the owner, can decide which sites you want to have access to. Otherwise this is pre-determined by the deals done between the TV manufacturers and individual video sites. So, unless there is a full-screen web browser built in to your fancy new TV, with Flash 9 or greater support, and the ability to control it, you won’t be able to watch the thousands of online video sites that have yet to make arrangements with the TV manufacturers, with no guarantee that they will in future. For the time-being, all Internet enabled TV sets lock you in to specific video sites as determined by the TV manufacturers. This will surely change, and must if the full potential of ‘TV 2.0′ is to be realized. For example, all kinds of very cool web-based interfaces to online video will undoubtedly launch that are specifically designed for Internet enabled televisions in future, with futuristic features that learn your tastes and moods. WorldTV is one such site aiming specifically towards this and Babelgum is doing it too, albeit as a downloadable application. With a full-screen (no toolbars or menus) browser in your TV, you will be able to use these cutting-edge interfaces to ‘watch TV’, just like the user interface or EPG from your cable or satellite provider. This is not currently possible with these first generation Internet TV’s. So my advice is to avoid the early crop of Internet enabled TV’s and wait until these features start to appear. If you’re dying to dive into all this web video on TV stuff, keep an eye out for TV’s and specialist set-top boxes from lesser known manufacturers – they are likely to be more progressive and with more open standards, until the big boys dive in. I’ll be posting about them and reviewing them on this blog in future, along with Internet enabled TV’s as they are released. In the short term, the best solution for watching online video on your TV is still (unfortunately) to connect your computer directly to your TV. Get yourself a long range wireless keyboard with built-in trackpad, and I suggest getting a dedicated computer to connect to the TV, and you’ll be able to browse any online video site you like, including the nascent alternative broadcast networks like WorldTV, Babelgum and Joost. Your other options include a new generation of set-top boxes which connect your TV to the Internet using an external box (eg AppleTV, Vudu, Neuros, PeerTV but expect many more soon) and video games consoles like the PS3 and Nintendo Wii which have Internet browsers built-in and are already connected to your TV. Be aware that the gaming consoles mentioned only have Flash 7 support, with no easy way for their manufacturers to update this, meaning very few video sites will play on the PS3 or Nintendo Wii. This with the notable exception of YouTube which has kept their video files at Flash 7, and the BBC iPlayer (only available in UK) which has re-encoded their content in Flash 7 to make the service work on the Nintendo Wii. If you do succeed in connecting your computer to your TV, and get tired of browsing individual clips (as I did), try a channel-centric service like Magnify.net, Vodpod or WorldTV. Try a live video network like Ustream.tv or Justin.tv. The importance of channel-centric services cannot be underestimated – the living room TV does not lend itself to watching 2 minute video clips, we’re used to watching long form content that flows over us. We watch TV and we’re the passenger, not the driver. This is an important distinction in habit. It turns out that individual clips work fine when you are 18 inches from the screen and have a mouse in your hand, but they do not work well when you are 10 feet from the screen and have a remote control or WiiMote in your hand. ‘Interactive TV’ never worked, we don’t want to be the director basically. You can’t change people’s habits easily, and the two experiences are very different indeed. So in conclusion, there is a long way to go before the promise of online video comes to TV. Make no mistake, when it does… it is going to be huge – with channel centric online video services and new style web based TV networks bringing exciting new choice to consumers, and opportunity laced challenges to the industry.